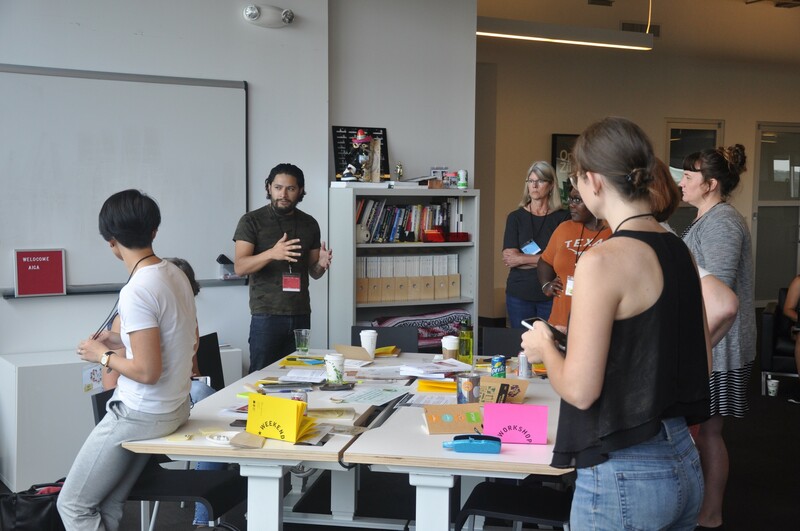 I was recently asked by members of AIGA Austin to facilitate their inaugural Changemaker Series workshop. The program, which started in Seattle, has made its way to Austin in 2018. Changemaker Series pairs creative professionals with nonprofits and social change organizations to use design thinking, sustainable frameworks and creative tools to tackle a new cause every year. This year’s cause is homelessness. Ideate — Organization sponsors meet their design team. The groups share knowledge and use design thinking techniques to create the foundation for the project work they’ll be doing in the coming months. 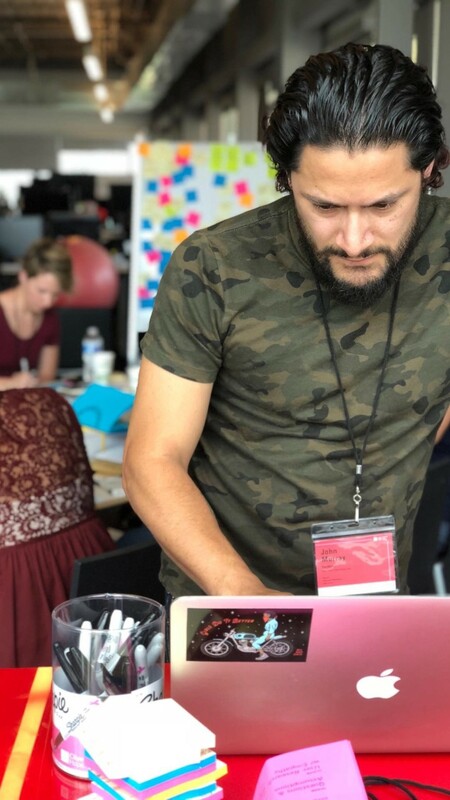 Create — Teams settle on a project scope and direction and begin to do user research and work toward creative solutions that address the year’s chosen social cause. Celebrate — At the end of the three months, the teams showcase their work to the public. 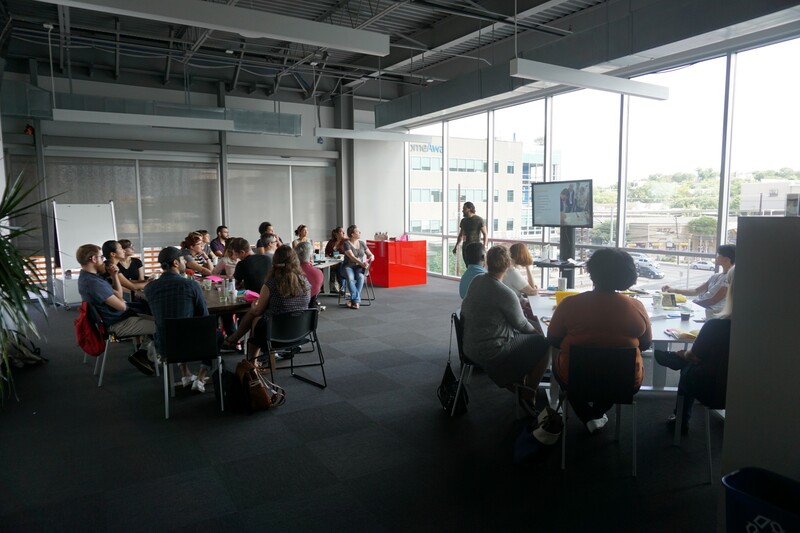 I was asked to facilitate the initial “ideate” kickoff workshop, which took place June 9 and 10 at R/GA in downtown Austin. This is the first time I’ve been asked to apply my design thinking skills to impact social change. Needless to say I jumped at the opportunity. How much am I teaching people about design thinking vs. focusing on getting concrete outcomes using design thinking techniques? This helps me decide how much I need to handhold folks through the introduction of each exercise. It also gives me a feel for how much is at stake. Are we here to learn and explore or are we here to walk away with an actionable 30-day release plan? How big will the group be and will I have any co-facilitators? I can facilitate big groups by myself if I have to, but it always helps to have back-up. At the very least it’s nice to have people to help me keep track of the time and to set up the easel-sized tear sheets. How many people in the group are familiar with design thinking? Knowing people’s familiarity with the methodology gives me a better sense of how to budget my time when I create the agenda. What are the non-designers expecting to get out of this? For this workshop I wanted to know how much collaboration we were expecting from our change organization sponsors. Also, how married are they to the pre-written prompts that they brought in for the teams to work on? I worked with Annamarie Cowart, one of the organizing committee members, to create an agenda that accurately balanced the need to introduce design thinking with the need to get teams the shared understanding required to be successful in these next few months. Give them a break — Logistically, I try to plan breaks half way between the start of the day and lunch and half way between lunch and the end of the day. Design thinking workshops can be mentally taxing, and you have to be mindful of that and account for mental fatigue. Mind your time — People are always going to come back late from lunch, and you’re never going to start the second day on time. These truths are practically laws of the facilitation universe so you have to create an agenda that takes that into account. Look for ways to pad your agenda with extra time because you might just need it. Always have an out — You might get through all the activities you wanted or you might not. You never can tell. But you should always have alternate plans — ways to change the course of the day’s events if you get in a bind. Question the prompt and the scope — As the facilitator it’s your job to shape the prompts that teams provide. Inexperienced workshop attendees don’t always know when their prompt is too vague or when it’s obvious that they already have a solution in mind. Day one was all about “meeting”. Meeting the mission, the teams, and the users. Day two was all about exploring solutions based on user needs at varying degrees of granularity. Scoping the prompts — To be honest, I was worried that one of the team’s initial proposal statements was too quick to propose a solution. Another team’s proposal statement seemed a little too vague. In the end, I felt like we could suss things out during the course of the workshop so I left well enough alone. Persona conundrum — Whenever you are running a workshop you want to hear from real users as much as possible. But since this one focused on people affected by homelessness, it was tricky. You don’t want to bring someone affected by homelessness into that type of environment and pepper them with questions. However, you don’t want to create empathy maps or personas based on unvalidated opinions. Team sharing vs. group sharing — When should playbacks be done at a team level amongst individuals and when should it be done amongst the teams-at-large? We did a mixture of both. When you have time you want all three groups to hear from each other. It allows them to cross-pollinate ideas and share the successes and struggles they run into along the way. Having been a newspaper reporter, I start every conversation with a lot of questions. 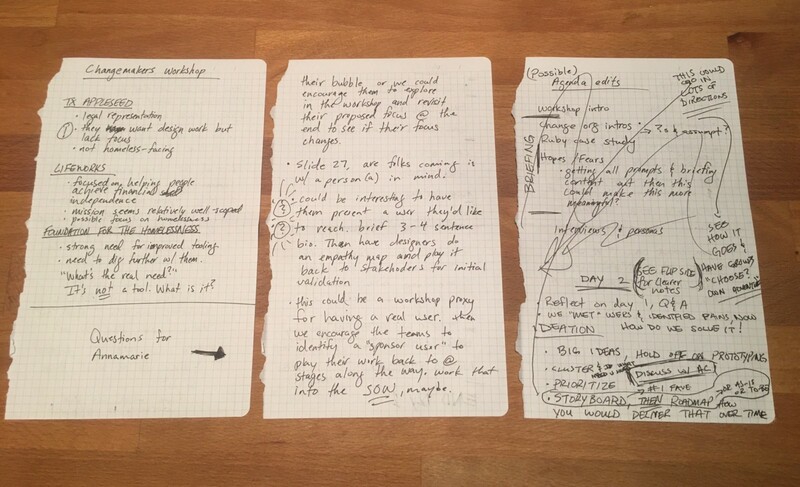 Workshop thoughts and a second or third draft of the agenda that eventually evolved into the finished article. Intro — Overview of the workshop and its goals. Set the ground rules. Meeting the organizations — Change organizations introduced themselves, their missions, and shared a little bit about the communities they serve. Questions & assumptions — With the introductions out of the way I took time to let folks throw out questions and write down assumptions they felt needed follow up answers. Any time I’ve gotten a new project I’ve had a number of questions and assumptions that needed to be documented. This seemed like a logical follow up to the introductory conversations. Case study on user research with homeless — Ruby Ku shared her experiences doing user research with people experiencing homelessness. She spent time emphasizing the need to develop empathy and sensitivity for people affected by homelessness. Hopes & fears — As we were building this agenda, I could only imagine that coming off the back of a discussion about having empathy might leave some of our designers with a number of things they were excited to tackle as well as a few things they were worried about getting wrong. Personally, I know I would hope that I could create solutions that changed people’s lives but would be worried about somehow being insensitive to the very people I was trying to help. 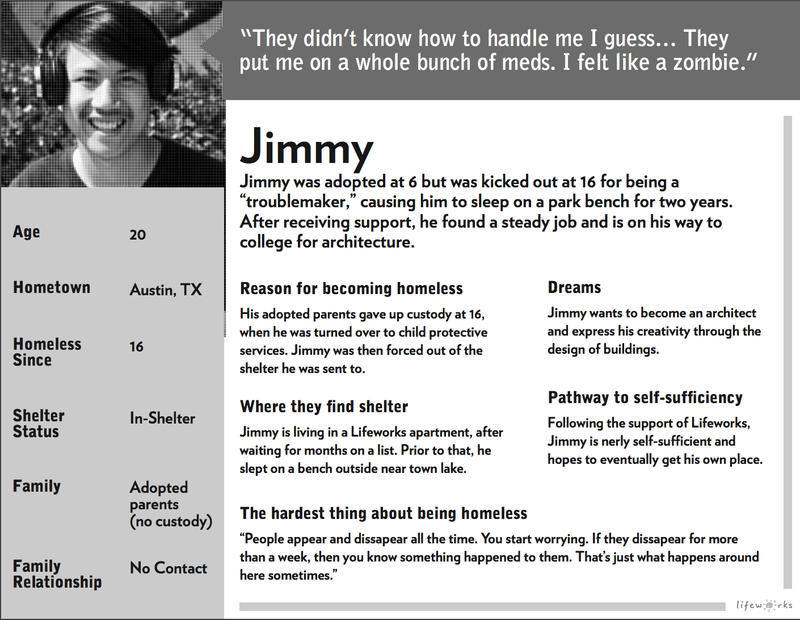 Meet the organization’s personas — This goes back to the “persona conundrum” I described earlier. Since it seemed a little insensitive to bring in people experiencing homelessness and ask them a thousand questions, we asked our change organization sponsors for help. Annamarie and I asked them to develop a persona worksheet that was a rough summary of the type of people they serve. This is one of three persona worksheets. It allowed us to avoid bringing in people experiencing homelessness who might feel uncomfortable being asked so many questions about how they’ve experienced homelessness. We were able to rely on the subject matter expertise that our change organization sponsors bring to the table. We used empathy mapping as a level-setting tool to put change organization sponsors and their designers on the same page about the end user. We were able to explain the difference between a user and a stakeholder — Why do we discuss an end user even when we have other people involved in our success that we need to take into account as well? We had a lengthy impromptu discussion where I was able to explain the difference between a user and a stakeholder. In the end, I told the teams that the goal was for everyone to understand the communities being served. I encouraged them to look into the design thinking field guide to consider building a stakeholder map later on down the road. After introducing the user, the designers worked with the other change organization sponsor to create an empathy map. The goal was for the designers to playback their interpretation of the user they were being asked to consider. We asked the teams to then play back the empathy map to the first change organization sponsor to see if there was total alignment and to address any inconsistencies. I finished up the exercise by reminding folks that no persona is complete without getting validation. A persona is useless when it’s solely based off of observational biases. I told them that in the coming months they need to be able to find users that match the user they created with their empathy maps. Finally, we ended the day with needs statements. Now that EVERYONE understood who the end user is they could start to identify the user’s needs and pain points. I explained to them that you’re more likely to solve a user’s problems when you can clearly articulate their needs. Normally I’d have them do a prioritization grid here before moving on, but in order to save time I had them choose their top 5 user needs. I’m always tweaking the workshop agenda. I treat them like living documents that evolve as the workshop progresses. Day two was incredibly exciting. We got to see the teams’ hard work from day one pay off. They had a firm understanding of the user, and so they were now ready to start to explore solutions to their problems. 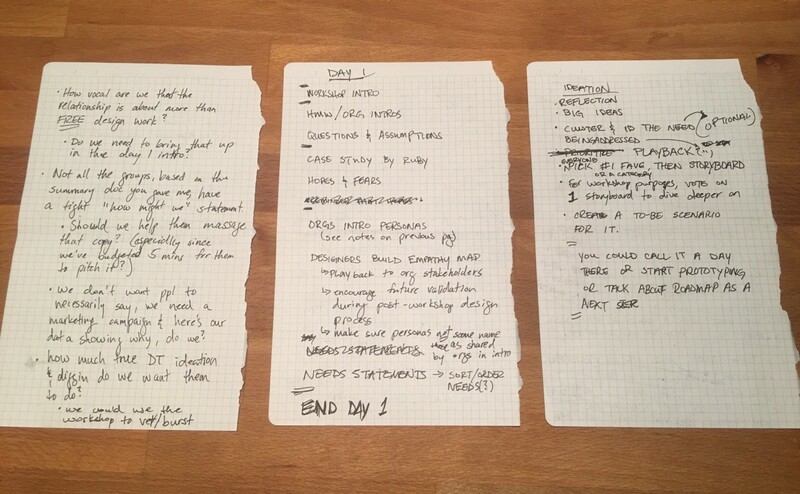 Recap and answer questions — We covered a lot on day one. I wanted to give folks a chance to ask any outstanding questions they had. This also gave me the chance to wait for any late arrivals before getting started. Big ideas — “We met our user, we empathized with them and their needs, and summarized those needs. Now, let’s do something to solve it!” I explained the value of thinking big and thinking without restrictions. I made it clear that we can always whittle away at ambitious ideas, but it’s much harder to take overly pragmatic ideas and make them great. The teams really went wild with big ideas. There were Post-its all over the walls and some worked their way down to the floor. These teams had no shortage of inspired ideas, better yet they were tied to user needs! Prototyping — We finished the workshop by having them create a tangible representation of their storyboards. Once again, we’re getting more granular. We’re digging deeper. What happens when we take the story and we make it jump off the page? When the user can hold the solution in their hands? Teams had a lot of fun with this one, too. In the end, I think the workshop was a success and I think I provided the foundation for what will prove to be an exciting and rewarding time for everyone involved in this year’s Changemaker Series. I’m looking forward to seeing what the team’s come up with! AIGA advances design as a professional craft, strategic advantage and vital cultural force.